Whether you want to replace your door knob for aesthetic reasons or your current door knob is damaged, replacing a door knob is an easy DIY project. Follow these steps from our home improvement experts and you’ll have it done in no time. What you’ll need to know, for how to install a door knob. If you see screws on the outside of your door knob, you’re in luck. Use a Phillips head to unscrew and remove the screws. If you don’t see screws on the outside of your door knob, look for a small hole and push a paper clip or thin nail into the hole. This should pop off the knob and reveal a face plate with your screws. Unscrew the screws to remove the face plate and outside knob. Next, unscrew the latch plate and remove the latch assembly. 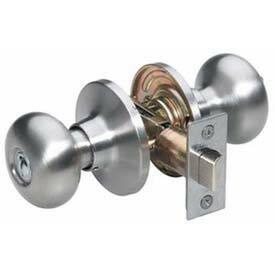 Insert and fasten your new latch plate (with the curved side facing the way the door closes) with screws. Adjust the face plate and the outside knob so that they’re in the right position. Thread the spindle through the latch and the face plate and insert into the knob. Screw the face plate and the latch into the base of the outside knob. Place the second knob on the other end of the spindle and turn it until it clicks into place.